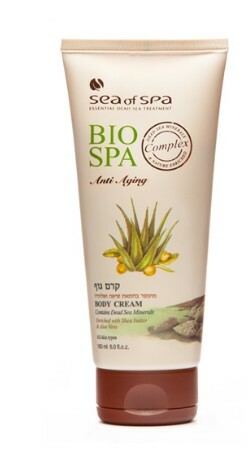 Dead Sea cosmetics that revitalize the skin, this body cream from Sea of Spa is enriched with Dead Sea minerals, shea butter, and aloe vera! Shea butter is a powerful moisturizer, and aloe vera is an age-old healer of many skin problems. Spa cosmetics from the Dead Sea, this enriched moisturizing body cream from Sea of Spa revitalizes the skin with shea butter and aloe vera. Featuring Dead Sea minerals, vitamins, Omega 3, 6 and 9 fatty acids, and pure essential oils, it is like having the healing properties of the Dead Sea with you always. Dead Sea cosmetics are world-renowned and sought after. Recently becoming popular in various cosmetics, shea butter has been a traditional natural source for moisturizing, reducing inflammation, and smoothing the skin. It is a useful remedy for dry skin, as well as for helping those with acne. With long term use, shea butter has been reported as softening and strengthening the skin, as well as reducing wrinkles. Aloe vera has been used traditionally in Ayurvedic medicine, and in many other cultures for healing and soothing. Aloe vera gel contains wound healing and anti-inflammatory properties, and can also be used to heal chronic skin conditions such as psoriasis, acne and eczema.